“Na Tum Aaye Na Neend Aayi Thumari Yaad Hi Ayei"
This was neither the beginning nor the end. Earlier, in 1939 he had composed music of Supreme Pictures “Ghazi Salahuddin” and “Meri Ankhen” in which some of the Ranjeet Movie-tone’s stars (Sitara , Ishwarilal, Kesri, Bhagwandas, Suresh and Yaqoob) acted. 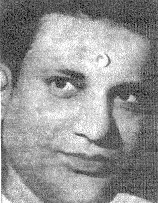 A legend to be in the Indian Cinema Music, young “Khemraj” on invitation of Chandoo Lal Shah of Ranjit Movietone shifted from Calcutta to Bombay and “Aaj Ka Hindustan”, “Diwali”, “Holi” and “Pagal” were produced in 1940. (Bilo.C.Rani was Khemraj’s assistant and continued with Ranjit Movie-tone till its closure). These were followed by Pardesi, Pyaas, Shadi, Umeed in 1941. His compositions also included Hundustan Chitra’s musical hits Rhimjhim and Sawan Aya Re (1949). Khemraj was born (1907) in family of celebrated singers of Rajputana (now called Rajistan). His father, Pandit Govardhan Parshad was court singer at the Jaipur Palace. Khemraj as a teenager also learnt khathak dance. At the age of 19 he was appointed as court singer by the Maharaja of Bikaner. It was followed by service in the Kingdom of Nepal. Later he joined the music team of Calcutta Radio. Thereafter he also had the opportunity to work with Timir Baran at the New Theatres. The main job of the composer of music for films is to achieve rhythmic unison between the scenes, actions and sentiments. He has also to harness the songs with pauses and tunes, matching the poetry. Naushad Sahib considers Khemchand Parkash to be his teacher in music. No doubt he was the best decorator of the sound track of films in Bombay. He joined Bombay Talkies in 1948 and composed music for films Asha and Ziddi. In Ziddi he extensively used Jal-trang and composed songs in Rajistani style to match with the theme of the story. During a visit to Ashok Kumar’s residence, he found a young boy murmuring some Saigol’s song. He was Ashok’s younger brother “Kishore Kumar”. After his willingness Kishor was taken as playback (of Dev-Anand) singer for the first time in film “Ziddi”. “Yeh Kaun Aya Rey Karke Yeh Solha Singhar- Yeh Kaun Aya” First Duet of Kishore with Lata. Khemchand gave language to the dialogue starved film "Mehal" through the background music. The film had the most classical combination of sound and image – thanks to the perfect night photography by Josef Wirsching - then Cameraman. Rehearsal of the theme song “Ayega Anewala” with Lata continued for several days. Khemchander Parkash forecasted to Lata “Beti - yeh bohut pasand kia jaye ga” but alas being sick he was unable to see its success and advancement of “Lata” through it. With the demise of Khemchand in August 1950 the Bombay Talkies became silent. Khemchand Parkash’s coffin was carried to Shivaji Park where large number of people paid homage to the departed soul. His ongoing films were completed by various music directors – (1950) “Jan Pehchan” of United Technicians by Manna Dey, “Muqqaddar” of BT by B. Shreshtha, “Jai Shankar” (1951) of Latika Picture by Basant Parkash, “Shri Ganesh Janma” of K.Pic and “Tamasha” - the last film of Bombay Talkies (1952) by Manna Dey. Thereafter the studios were rented - the last production being BTWI Cooperative Society’s Badbaan” (1954). Some time back a news item stated that a huge sum of rupees fifty lakhs was payable as royalty to the departed Khemchand Prakash for his immortal music compositions. But the real homage lies in appreciating his talent and efforts and paying due regards to his trend setting contribution to the film music. "Ab Kahan Basera Apna" – "Aayega Aaneywala Aayega Aayega"
Mr. Maqbool Ahmed is an Ex. Mechanical Engineer, Pakistan Railways. He is also a great connoisseur of Old Urdu / Hindi and Punjabi Music. Highly nostalgic about legendary music composers and singers of the first three decades of talkie films of the sub-continent. Punjabi folk song “Pani aaya pulaan de heth mahiya” and the earliest Punjabi song of Lata ( “Galian wich pirdey dhola nikkey nikkey baal wey’) from film Chaman are examples of his choice. He is a decent, loving, god fearing and helping person. May God bless him with healthy and happy long life. 18. Tujhe O Bewafa Hum Zindagi Ka Asra Samjhe – Lata.